Wow what a Year!! 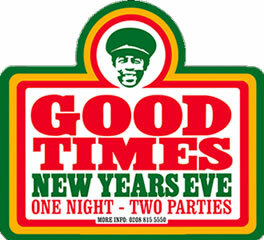 After celebrating thirty funk filled years at The Notting Hill Carnival this year with one of the biggest and best attended carnival’s to date, Good Times is now rolling out this year’s NYE eve celebration and sunshine vibes to the WHOLE of London, with not one, but TWO parties in our sprawling metropolis. First up in North London (and new to Good Times) is one of the best kept secrets of a venue, The Relentless Garage in Islington. With a fat live music pedigree and full refurbishment in June 2009, The Garage has played host to many a fine line up and NYE will be no exception. Next up we’re South of the Thames and back to one of our favourite haunts which has witnessed some legendary Good Times parties in recent years, the newly refurbished Grand in Clapham Junction, a magnificent Victorian-era listed building and one of the most stunning period theatres in the capital. After SIX previous sell out NYE parties all over London, incl 2009’s hugely acclaimed warehouse party at Hearne Street car park which saw some amazing party scenes despite the sub zero temperatures, we know how hard (and expensive) it can be travelling around the capital on the biggest party night of the year. So with that thought in mind (and in direct response to YOUR numerous requests), Good Times are to bring the party to ALL our loyal fans this year with TWO special events at TWO outstanding London venues on the SAME night, making it much easier for EVERYONE to see in the New Year with a Good Times bang WITHOUT the hassles of travelling half way across London to do so. With TWO incredible deejay line ups and headliners that rarely play together, London legends Norman Jay and Gilles Peterson will be playing BOTH events, with guest deejays at The Clapham Grand being Terry Farley (Faith/Boys Own), Rudy Ranks and the Loud Minority deejays Russ & Melvo hosting the Altitude bar. Guest djs at The Garage include the Ladybugz and the Crate Diggers collective hosting room 2.